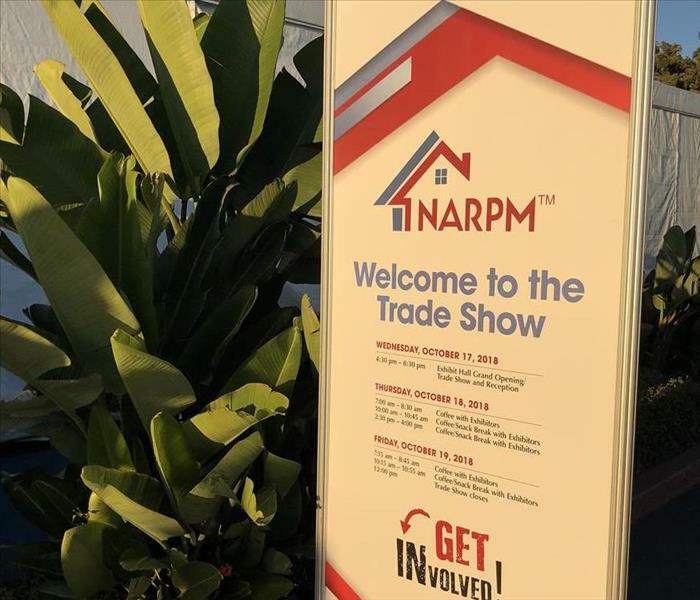 Our team is proud to support the NARPM Organization and has enjoyed networking with Property Management Professionals at the annual National Convention to discover how we can best serve our clients! A Mill Creek neighborhood flooded Wednesday after a retention pond overflowed. The City of Mill Creek says two trees snapped and smashed a beaver dam, releasing a gush of water into the neighborhood. Several houses were flooded and street were closed for hours while emergency crews worked to remove the waist-high water levels. Our crews were dispatched immediately and began helping customers extract water from their ground floors. 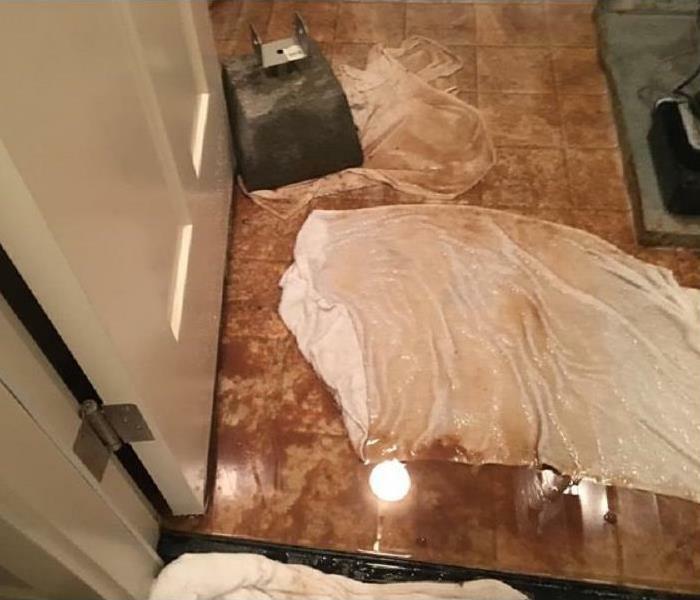 This Mountlake Terrace basement flooded due to a severe rainstorm that caused excessive groundwater. Groundwater can carry unknown contaminants that can travel with the rain water that passes through the soil and pickup potential pesticides which become deposited in the home. We worked quickly to extract the standing water, decontaminate and begin drying the structure and contents. 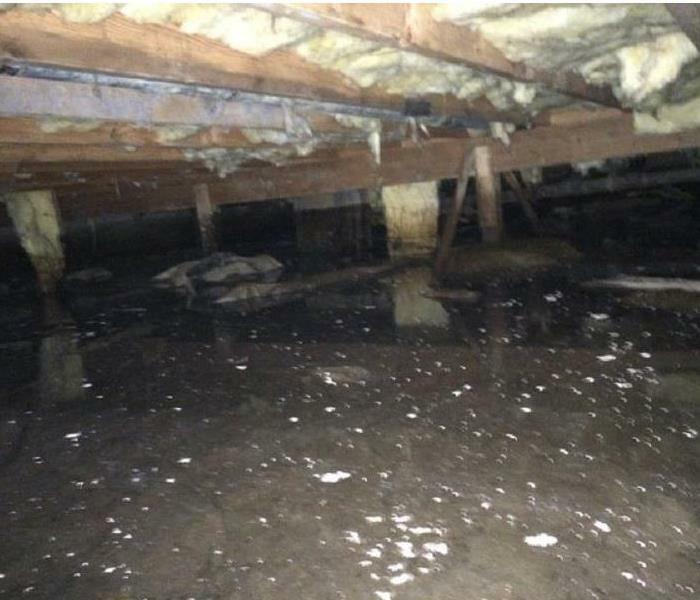 This Seattle home was affected by a broken pipe in the crawlspace which created significant visible microbial growth. Our team tackled the problem with proper protective wear and remediated the damage by removing mold, wet insulation, drying the structure and replacing the vapor barrier. 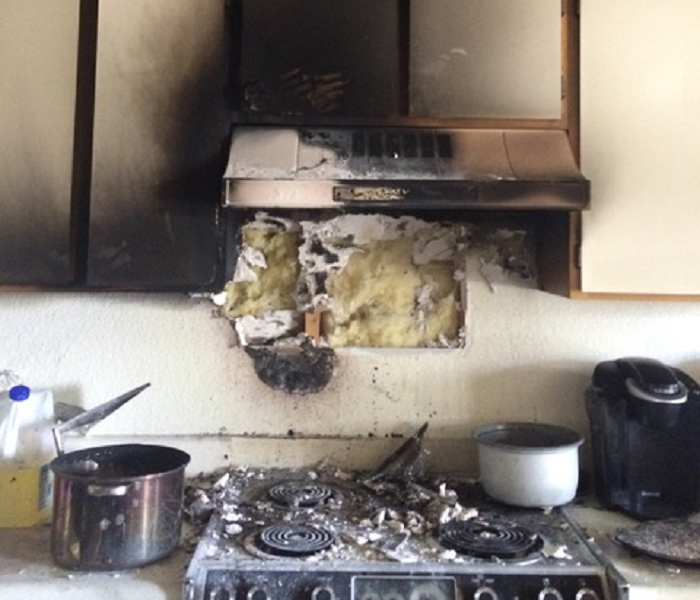 This kitchen fire was the result of a microwave that malfunctioned and caused extensive soot and smoke damage throughout the home. The kitchen was nearly unrecognizable upon arrival with heavy residue on walls, ceilings and all household surfaces. This vacant commercial strip mall suffered water damage after a pipe burst in the wall during cold weather. The room had standing water and required immediate extraction. Our team responded quickly and began the drying process. 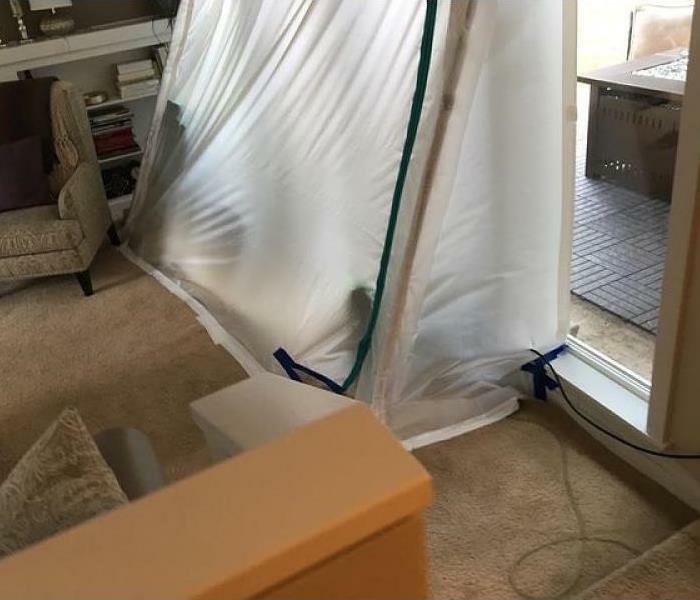 This Bellevue home was damaged during a storm and required an emergency board-up and cleaning for the floor to ceiling windows that had broken in the living room. We securely packed and moved contents of the home so that the owners could move out while repairs were made. 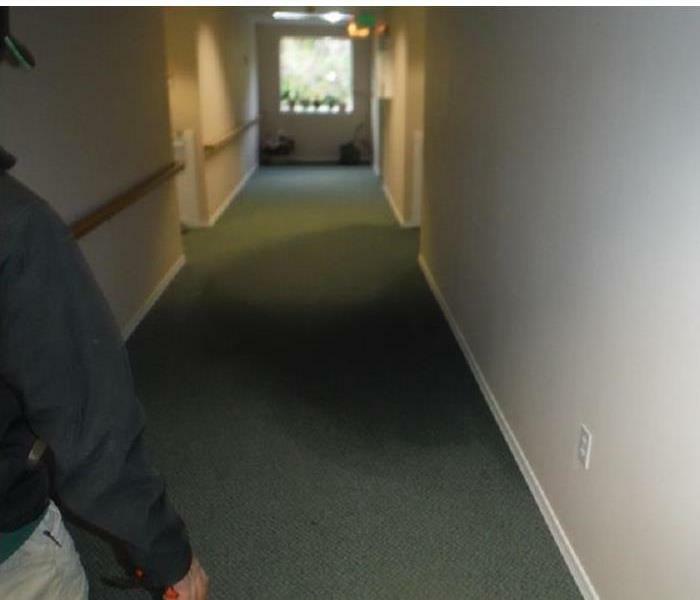 This carpet shows visible signs of microbial growth due to a water leak that went undetected. In this situation the carpet was disposed of and our team treated the area with an anti-microbial serum. This Bothell apartment fire took place after food was left unattended on the stove. Our team worked diligently to clean the structure and pack out affected contents that could be salvaged and cleaned. This devastating church fire in Mount Vernon required many hours of hard work from our team members. SERVPRO was able to salvage many items that were soot and smoke damaged. After several weeks of cleaning and repairs the church was fully functional. 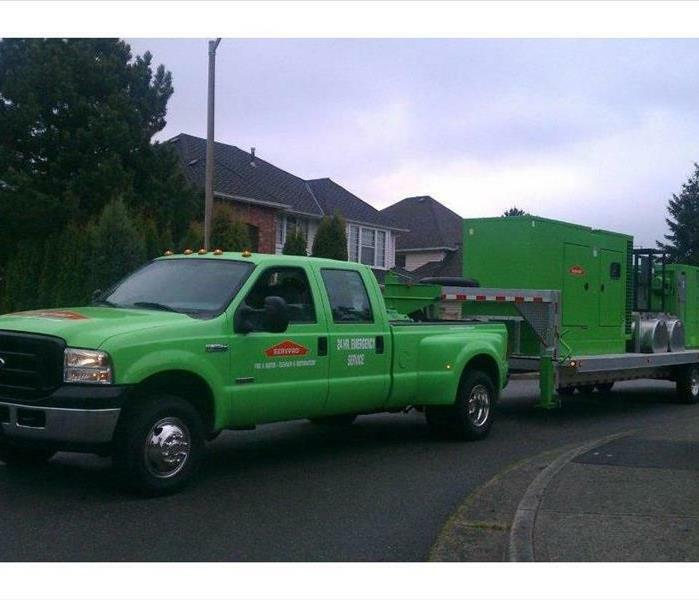 Our team packed out a large home that was affected by water damage. All contents were cataloged and taken to our warehouse to be dried, processed and stored until the homeowner was finished with restoration and repairs. This Lynnwood home had severe water damage that flooded the entire second and main floor of the home. We utilized our desiccant to dry the structure as there was over 2,000 square feet of affected area. This commercial building suffered a large water loss due to a broken pipe during construction. Our team arrive onsite just 30 minutes after the first phone call and began extraction services immediately. 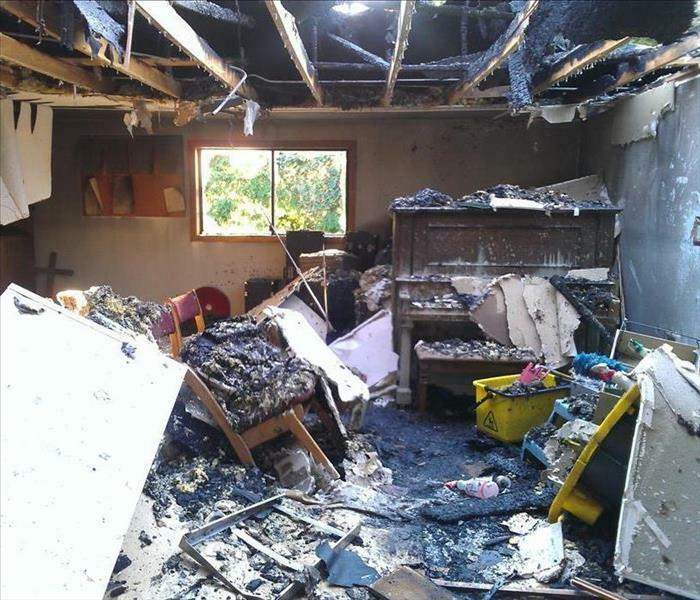 This church suffered a devastating fire from a cigarette that was not properly extinguished. Our team was the first to respond and met with the adjuster to determine scope of work. The fire damaged several rooms which needed to be gutted and rebuilt. We also cleaned and stored all of the contents for the church until their items were ready to be packed back. 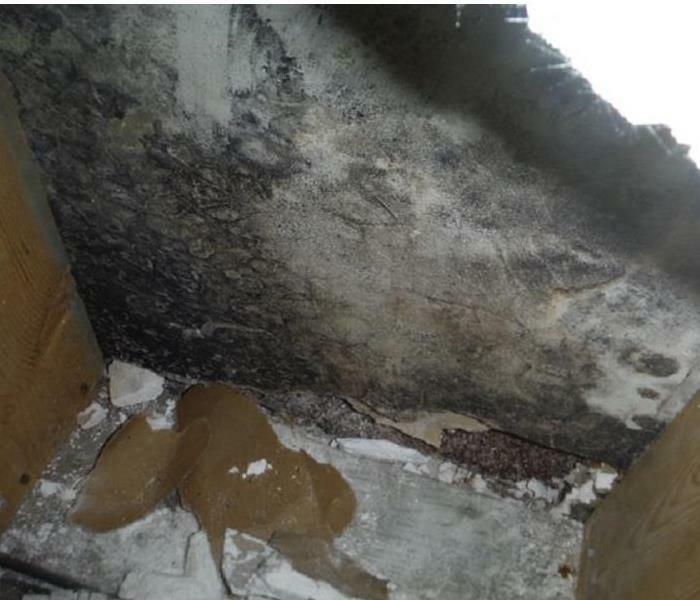 This home had a moisture problem that caused a serious mold problem as you can see in this picture. We came in and removed all the moisture and mold and took care of all the repairs. This facility had a water loss and the carpet was still soaked when we arrived. We brought in drying equipment such as fans and HEPA filtered air scrubbers to help remove all of the moisture. This home had a backup of sewage water that caused extensive damage. The contaminated materials such as flooring and carpet were removed and excess moisture was dried. Our team worked diligently and quickly to restore the bathroom to normal conditions so that the family could return to their everyday lives. Severe storms dumped heavy rains on our area that caused this crawlspace to flood, as you can in the image. Our team responded and was able to remove all the water and clean up the damage. This condominium had a fire that started in the kitchen and spread soot and smoke throughout the unit quickly. The property management company asked us to respond and we worked closely with the insurance company to salvage and clean many of the household items. 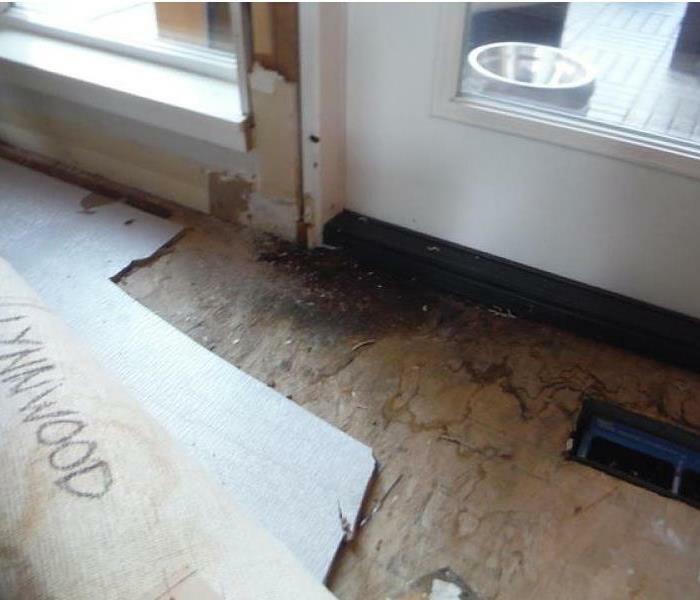 This Lynnwood home had mold growing on the subfloor under their carpet. The culprit was actually an eroded seal on the back door allowing for rainwater intrusion. Our team responded quickly to perform restoration services and treat the area with anti-microbial serum. Containing microbial growth is necessary during remediation for health and safety reasons. The spores from mold spread by airflow. By containing the mold the rest of the home will not be contaminated by spores during the cleanup process. It is important to our customers that we take good care of the items we process and clean from their homes. 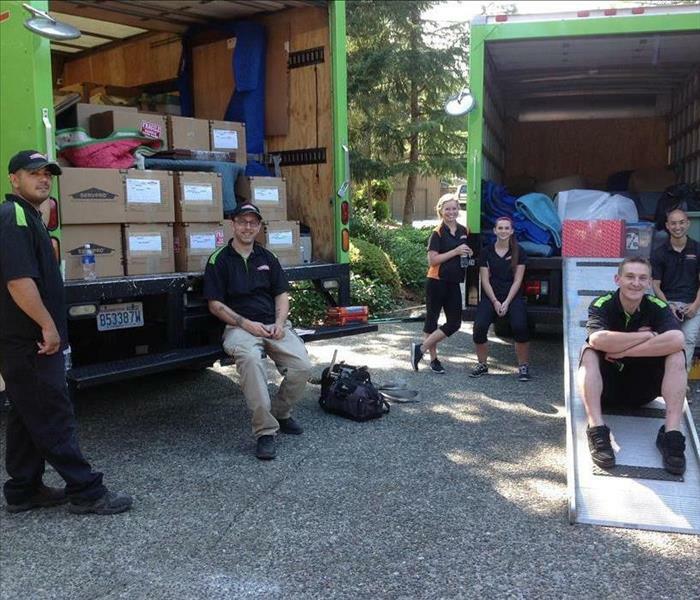 We provide full packing and moving services with secured and heated storage at our Lynnwood warehouse. SERVPRO of Lynwood is ready for whatever happens. Our large desiccant helps with large commercial water damages. When drying a commercial building the desiccant will dry faster and cheaper than using all the small sized dehumidifiers. We are located at 19327 21st Ave West Lynnwood, WA 98036. Our team is available for commercial and residential emergency response 24/7 365 days a year, we make disasters "Like it never even happened."